Which was first, the automobile or the American Revolution? Surprisingly, the automobile was first. 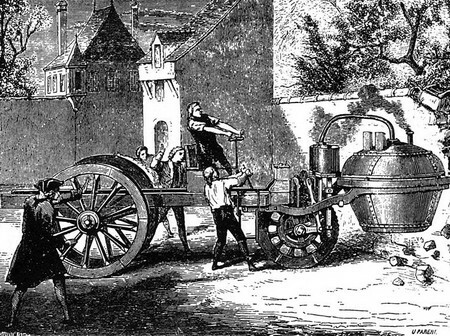 In 1768, the French military engineer Nicholas-Joseph Cugnot built a self propelled vehicle for moving large artillery pieces. It was steam powered, and was configured in a tricycle configuration, with the front wheel providing steering, and a huge boiler vessel hanging off the front "bumper", so if it hit anything, it would be sure to rupture the boiler. It was capable of 2-3 mph, and in addition to pulling an artillery piece, the vehicle could carry up 4 people. Cugnot's vehicle was slow and unmaneuverable and crashed into a wall, the incident becoming the first automobile crash in history. The weight of the steam engines of the day was just too great to put on a vehicle and the chassis was way too heavy, and the steering was rudimentary, but it did move under its own power. Other steam powered devices are in the Steam Power section.